Building Type Basics books provide architects with the essentials they need to jump-start the design of a variety of specialized facilities. In each volume, leading national figures in the field address the key questions that shape the early phases of a project commission. The answers to these questions provide instant information in a convenient, easy-to-use format. The result is an excellent, hands-on reference that puts critical information at your fingertips. 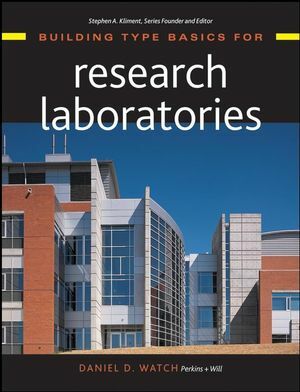 Building Type Basics for Research Laboratories provides the essential information needed to initiate designs for government, academic, and private research laboratories. Filled with project photographs, diagrams, floor plans, sections, and details, it combines in-depth coverage of the structural, mechanical, energy, cost, and safety issues that are unique to research laboratories with the nuts-and-bolts design guidelines that will start any project off on the right track and keep it there through completion. DANIEL D. WATCH, AIA, is an architect and laboratory planner with the renowned architectural firm Perkins & Will (recipient of the American Institute of Architects' 1999 National Architecture Firm Award). He has personally coordinated the design of nearly twenty major research laboratory facilities. Appendix: The Laboratories for the 21st Century Initiative.